email newsletters directly from Knees N Toes with new items, special promotions, and other information. 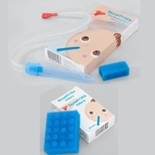 This aspirator is better and safer, since you never put anything inside the nose, and you control the amount of suction you apply. It does not irritate the sensitive lining of the nose. Children tolerate Nosefrida better than other aspirators. Nosefrida is manufactured by Nasalprodukter AB in a modern factory in Malmo, Sweden. ANY QUESTIONS OR CONCERNS PLEASE FEEL FREE TO CONTACT US, ENJOY OUR SITE, PLEASE SHOP AGAIN. Copyright 2008-2013 Kneesntoes.net. All rights reserved.